4/22/2019 6:07:37 AM - It's been many months since I've had an opportunity to write an updated newsletter. The summer for me was mostly spent focusing on our son and his last period of freedom before entering kindergarten, which just began last week. We took time to enjoy our area, from the beaches, fishing with friends, going to the farms and wineries (the little ones would romp with the farm dog or cat in the grapefields while the adults would "taste" and get sloshed on the wines! ), etc. I hope you enjoyed your summer as well. So onto the latest events. JUNE & JULY TOUR BLOGS -- I had the opportunity this summer to get to Japan twice, performing in duet settings as well as with the band at the Honmonji Shrine, which was a treat. I've recorded the daily events in a series of blogs, but some of you have written to let me know that the blogs cut off at the end. This is an obvious error in the ArtistShare program which I've notified tech about, and I've gone back to fix them. Now with more time to dedicate to the website and my overall work, I will be uploading pictures from the July tour, as well as other things, so please check back often. In fact, in the next few months, I will be revamping the face of the website as well. 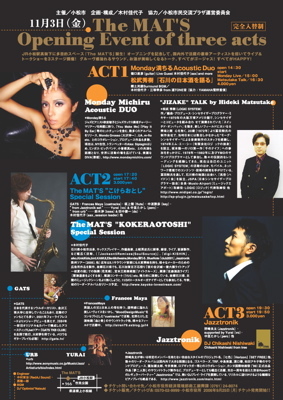 MAGAZINE COVERAGE -- I'm excited about a few Japanese magazines that have used me in their pages recently. One just came out a couple weeks ago, GRAZIA. It was a tie-up page with Cartier for their new line of watches, La Dona de Cartier, and I was asked to pose as the Mexican actress Maria ?? (the last name escapes me). I haven't seen it yet, but my folks had a friend send them a copy of the magazine, and they have raved about the images. My mother was aghast that Cartier didn't present me with one of the watches -- as if. Another will be out in October, TOKYO CALENDAR. It will be made available in Japan, obviously as well as the New York Kinokuniya book shop. For their New Yorker special feature, they asked me to round up three men in New York who I'm affiliated with to pose in Paul Stuart clothing. There was no question that my husband Alex Sipiagin would be one, and he suggested and helped me round up the other two: drummer Antonio Sanchez (regular member of Pat Metheny's groups, Michael Brecker, etc.) and guitarist David Gilmore (has played in my band, MChristian McBride, Wayne Shorter, etc.). We only finished the shoot last week, and I was amazed at everyone's transformations and ability to pose so well! And finally we have a spread in the December issue of a new men's lifestyle magazine called STRAIGHT for their New York jazz club special feature. I asked how they got the rather precarious name (considering it's a men's magazine) and they said it came from the drink, straight no chaser, but as there is already the UK magazine with that name, they shortened it. They asked Alex and me to help recommend clubs, set up some interviews (specifically with my step-father and also pianist Hiromi, who I recently met at my mother's trio engagement at Birdland in August where we shared the same table), etc. Also here in the States I have a one page spread in CHIN, a new cultural magazine for their September issue.